You’ve gotta love fall and all the great produce that crops up at this time of year. Squashes are everywhere in all their resplendent colors and one of my personal favorites, the yam, is found in abundance for all those wonderful holiday dishes that will soon be popping up in people’s kitchens. I’ve been making more of an effort to eat seasonal produce not just to partake of great deals but to enjoy what certain foods are supposed to taste like when harvested at their peak. Here in the US we are very spoiled in that we usually have any type of produce we want right at our fingertips no matter what time of year it may be: asparagus in November, apricots in February… it gets so that we just don’t appreciate food seasons the way we ought to because of the instant gratification we’re so used to receiving. This point has been brought up to me a couple different times over the past few weeks, particularly from folks who have lived abroad or have immigrated to the US from places like Uzbekistan or Kenya. In those countries it’s unheard of to have tomatoes in October or any other non-seasonal eating because they just don’t have the same type of set up we do (refrigeration, huge grocery stores, etc.). Learning about how other people of other cultures cook & eat renewed my interest in exploring more seasonal products and I thought I’d start out with something easy: the lovely little yam. Recently, I was lucky enough to find some great yams (okay, technically they were garnet sweet potatoes; someday I’ll get them all straight) at the Co-op at the low, low price of just $0.79/lb. I made sure to pick up a couple in addition to the cutest little butternut squash ever, which was also on sale. The beauty of seasonal eating is that you can find fabulous deals on produce that is actually (go figure) in season. Practically every store I’ve either been to or whose ads I’ve checked out lately are offering yams, sweet potatoes, pumpkins, spaghetti squash – you name it! - at wonderful sale prices. Though I love sweet potatoes even as simply prepared as baked with a little bit of butter on top, I thought it would be fun to try something new (to me) and add them to some pasta. 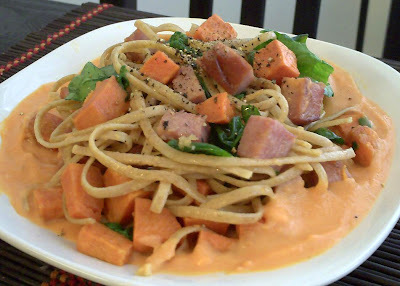 The rest came to me as I smelled them roasting in the oven: smoky tasting ham to go with the sweetness of the yams and the nuttiness of the pasta, lightly wilted spinach for color and a different texture; I was set. Though my four main ingredients did seem to go well together aesthetically and flavor wise, if I just them together like that the dish would be a bit on the dry side. I wasn’t quite sure exactly how I would remedy this until I saw I had way more roasted yam cubes than I did ham or pasta. A creamy sauce using some of the roasted sweet potatoes seemed like a fun, albeit odd, idea. I’m glad I followed my creative instinct, though; the sauce was just what the dish needed to tie everything together. Sure, you can get away with adding a little extra butter to the dish to moisten things a bit, but take a leap of faith with me and try the sauce – it’s tasty and very easy to make! Because I wasn’t about to go out and spend $2 on some heavy whipping cream just to make this sauce (use what you have on hand!!! ), I used the fat free milk to make it. I was quite pleased with the result because it kept things on the lighter side while still keeping things a little creamy. Though a little labor intensive (not difficult, just some extra steps), I really liked this dish. And when all was said and done I ended up with 4 huge helpings (possibly 6 normal sized ones... hello, leftovers! ), the entire recipe coming out to just over $8. Not too shabby! Preheat oven to 400 degrees. In a large bowl combine the sweet potato cubes with the olive oil, salt and sugar. Toss until completely coated then spread onto a foil lined baking sheet making sure you have an even, single layer. Roast in the oven for about 25 minutes or until they are tender on the inside and just slightly browned on the outside. Set aside to cool. Bring a large pot of salted water to boil and add the linguine. Cook the pasta until it is al dente and drain. Set aside (you might want to add a tiny splash of olive oil to keep the pasta from sticking). To prepare the sauce, measure out 3/4 c of the roasted sweet potatoes. Melt the butter in a medium skillet. Add the garlic and cook for about 1 minute then add the sweet potatoes, sauteeing for about 2-3 minutes. Remove from heat and transfer to a blender. Add the milk and puree until completely smooth. Check for flavor, adjust salt & pepper accordingly and set aside (if the sauce becomes too thick when standing, simply thin it out with 1 tablespoon of milk). In a large skillet sprayed with cooking spray, quickly heat the remaining minced clove of garlic. Add the ham and stir fry over medium high heat until it starts to brown. Add the spinach and cook until it just begins to wilt (don't overcook!). Next, add the linguine and toss together well. Finally, add the remaining sweet potatoes and fold into the pasta gently (so you don't squish 'em). To serve, spoon a few tablespoons of the sweet potato sauce onto a dish. Top with plenty of pasta, ham and veggies, add as much freshly ground black pepper as you like, and enjoy! Have you thought about Farm Fresh To You? They deliver a box to your door however many times you want a month and it's filled to the brim with seasonal, organic, fairly local produce. I think you would have a lot of fun with it, it's a box full of surprises! and you can also customize it so you don't get any fruit of vegetables you don't like.